Thanks to TLC Book Tours, we're pleased to present a review for Reconstructing Amelia, a new contemporary mystery by Kimberly McCreight. Make sure to check out the rest of the tour stops to see other reviews! 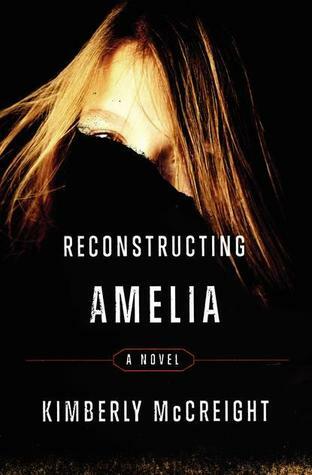 Reconstructing Amelia tells the story of a grieving mother trying to piece together what really happened when her daughter died. The story flips between the past and present, and incorporates traditional narrative, emails, blog posts, Facebook posts, and text messages to tell its story. I felt like this story really used its different modes of storytelling well. You learn just enough from each of them, and then they're backed up or expanded on by the narrative sections that follow. Each section is dated so you know when you're flipping back and forth in time. The text messages in particular are heartbreaking, especially as Amelia starts to be viciously bullied by people at school. Amelia can be a hard character to invest in -- you already know that she's dead, and there's no changing that outcome -- but you can't help but feel for her as she deals with how complicated her life suddenly gets at school. There aren't really that many likeable characters in the book. You feel sympathy for Amelia, but also wish that someone, anyone, would have equipped her to stand up for herself better. Sylvia, Amelia's one and only real friend, is kind of self-centered and a jerk to her, which Amelia acknowledges but still stands by her anyway. Most of the other kids at school are just horrific, especially once one group turns on Amelia. The adults aren't much better, either, and many of them seem content just to stir the pot, so to speak. I've heard some people compare this book to Pretty Little Liars and Gossip Girl, in terms of rich girls behaving badly, so if you like those sorts of stories, you may want to give this one a chance. I'd probably add a dash of Desparate Housewives to that description, as there are plenty of adults behaving badly, as well. All of the action in this story is completely over the top -- whether it's an remotely accurate portrayal of life at an expensive Brooklyn private school or not, I couldn't tell you. The book does make me incredibly glad that I lived out my teenage years before social media as we know it today really even existed. There was enough meanness over email and IRC and AIM to go around; I couldn't imagine living in the days of Instagram and mass texting and Facebook. I did enjoy trying to figure out what really happened to Amelia. There were some plot twists that I guessed, and some others which I still wonder where they came from. Also, there were some plot lines that I felt didn't really go anywhere. The subplot regarding Amelia's father seems to go nowhere for a while, and then it goes somewhere but in a way that felt hasty, like the author realized too late that she wanted to connect the storylines. There's a supblot regarding a man who Kate met once, years ago, which seems like it's going to be important but just trails off. I was astounded at the fact that the detective assigned to Amelia's case allows Kate to accompany him when he's interviewing people. I don't think that could ever possibly be proper protocol, although it makes for a more interesting story And while I know I reviewed an ARC and maybe, hopefully, this has been fixed in the print version, but there's a string of emails that date to 1997, and they're attributed to a Gmail address, only Gmail didn't start its service until 2004. This unreasonably annoyed me, but I suspect the average reader will be able to overlook it. I wasn't a fan of the epilogue, as it was a little too neat and "let's wrap up all these loose ends" for me, since the story itself just sort of ends abruptly once Kate learns the truth of what happened. I probably would have liked the ending a little better if it had been more open ended. This story includes a lot of sexual content, as well as some drinking and talk about drugs, bullying, strong cursing, and talk about suicide and self-harm. I think this book is being marketed as adult fiction, but I think that more mature teens would be fine reading this, though I'm guessing they may not care as much regarding some of the plots involving Kate. Sounds like this is a book to keep readers guessing!